Joseph Horn, a Philadelphian with no restaurant experience, and Frank Hardart, a cook from New Orleans, opened their first restaurant in Philadelphia on December 22, 1888. Their tiny 11 x 17 lunchroom at 39 South 13th St. wasn’t fancy—simply a counter with 15 stools. But Horn & Hardart soon had a steady stream of customers drawn by its novel New Orleans-style French-drip coffee. A trip Hardart took to Berlin in 1900 inspired a unique twist to H&H’s restaurant business. 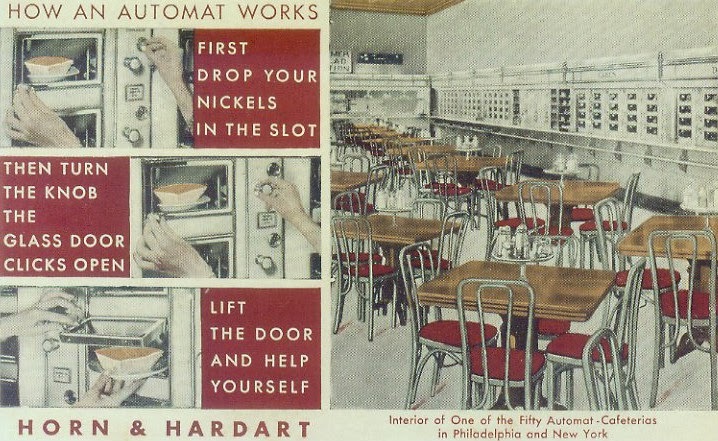 While there, Hardart came across an automat—a restaurant without servers where customers used tokens to purchase food housed in glass-doored compartments. Hardart envisioned an assembly line of diners putting together their own meals. 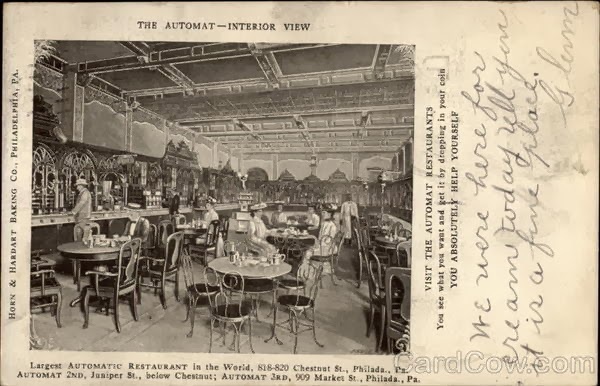 And by June 1902, Horn & Hardart opened their first automat at 818 Chestnut St. in Philadelphia. 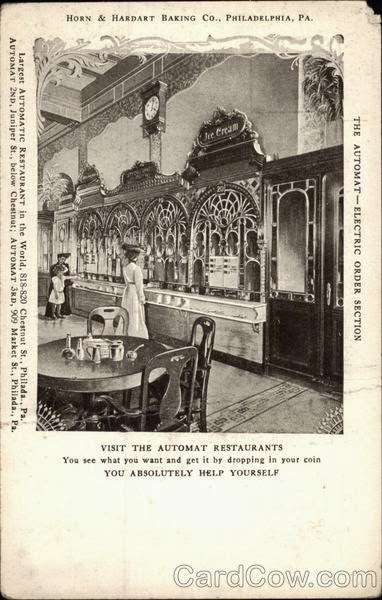 Diners at H&H first visited attendants in glass booths—nicknamed “nickel throwers”—to exchange their coins and paper money for the five-cent pieces the automat required. Tokens in hand, customers approached the automat, peering at the already prepared foods showcased behind small glass windows. Some compartments were cool; others were hot. Seeing food housed in sanitary compartments probably meant a lot to early H&H customers, who had likely been spooked by the food contamination scares so common at the time. All was self-serve—drop your tokens in a slot, raise the glass and take your plate. Then shuffle to a shiny table in the hall to eat your meal. Behind the wall, staff would quickly refill the empty slots with sandwiches, side dishes and desserts so they’d be waiting for the next customer. What was on the menu? Favorites included mac and cheese, Boston baked beans, chicken pot pie, creamed spinach and rice pudding. The entrees were tasty, and H&H had created a concoction that appealed to American tastes, blending novelty, choice and quality. 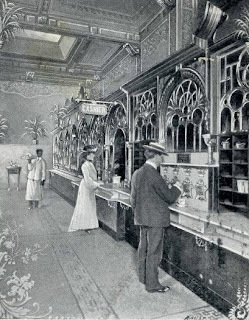 It was a recipe for success, and by 1912, Horn & Hardart opened its first automat in Manhattan. The view from Philly H&H in 1911: "a fine place." Image courtesy of Card Cow. As the company evolved, some H&H locations began to offer sit-down waitress service; others cafeterias. At its peak, Horn & Hardart had 44 restaurants and 55 takeout stores in Philadelphia. 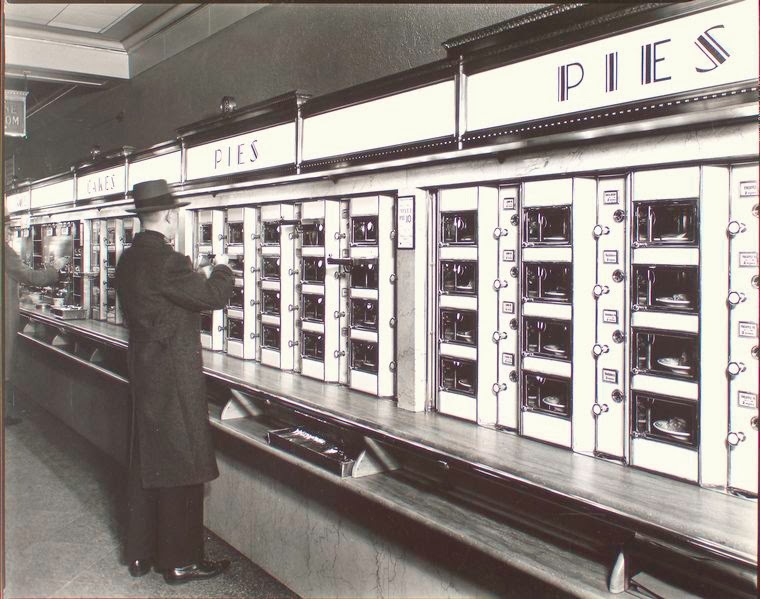 In its heyday, 800,000 customers a day were served in 80 locations located throughout Philadelphia and New York. Quality control and consistency. Say what you will, but at McD’s, you always know what you’re gonna get. H&H set the standard for this. Supplies were centralized and a leather-bound rule book defined proper handling of nearly 400 menu items. H&H execs lunched at the Sample Table each day, sipping black coffee between courses. Each day the coffee came from a different H&H outlet so that execs could verify that their most popular offering was up to snuff everywhere. Fast service, no tip required. One of the advantages of McD’s is that you can get in and get out. H&H was the first to bypass waitress service, and even provided stand-up counters for customers to eat “perpendicular meals.” H&H was also ahead of its time in providing meal solutions to busy moms. Way back in 1924, H&H opened retail stores to sell automat favorites to take home, promoting them with a “Less work for Mother” slogan. Freshness. When I worked at McDonald’s as a teenager, I was schooled that any burger that sat longer than 10 minutes was to be discarded. In fact it was H&H that set the first standards for freshness. No food could be left overnight in any of its restaurants. At closing time, surplus food was shipped to its “day-old” shops. And each H&H coffee batch had a time card. After 20 minutes, expired coffee was tossed and replaced. Economical. H&H helped keep food costs low by creating the first food “assembly line.” Fast food joints have been replicating and honing this formula ever since. If you think Starbucks, founded in the 1970s and expanded in the 1980s, launched America’s first coffee craze, you’re wrong too. Horn & Hardart introduced fresh-drip brewed coffee to the masses. Brewed coffee hardly seems revolutionary now, but before H&H, coffee was a harsh, brackish drink made by boiling coffee at length, along with eggshells(!) to clarify it. The H&H fresh-drip brew quickly gained a reputation as the best, and many H&H java addicts became loyal customers for life. From 1912 to 1950, a cup cost a nickel, and in the 1950s H&H sold more than 90 million cups of coffee each year. Though for a time it was hard to imagine that there ever wouldn’t be an H&H, by the mid 1960s, French fries were in and the “number of burgers sold” sign steadily ticked up at the rival Golden Arches. The automat’s chrome fixtures seemed dated rather than quaint. And the land rush to the suburbs meant fewer customers were near H&H outlets. During the 1960s, the New York branch of H&H attempted to evolve, making some of its sites subjects of the Burger King realm. In Philadelphia, the old guard at H&H discounted the burger joint craze sweeping America. One H&H vice president reportedly wrote off its key rival, claiming, “Adults will never eat in McDonald’s.” Yet by 1968, the flagship automat on Chestnut Street sank. Though the Philly branch tried valiantly to hang on, by 1986, after two bankruptcies, H&H was down to its last surviving outlet in Philadelphia in the Bala Cynwyd Shopping Center on City Avenue. H&H tried to revitalize, opening two new outlets in the late 1980s in Bensalem and in Jenkintown. Though the new president hoped to draw both loyalists as well as younger patrons with a hankering for classic food, H&H soon found it couldn’t dine out on nostalgia. In 1990, the last original H&H eatery in Bala Cynwyd, as well as the newer H&H outlets, closed. In the early 1990s, entrepreneurs tried to make a go of selling signature H&H food items likemac and cheese and tapioca pudding in supermarkets, but the venture didn’t make it very far into the 21st century. The way it was: The H&H automat. Image courtesy of Card Cow. 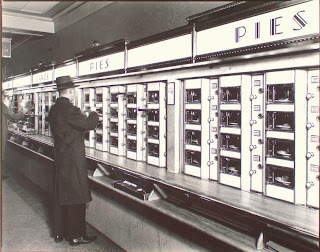 Alas, you can’t put three coins in an automat any more, but you can feast your eyes upon a 35-foot section of Philadelphia’s first automat in the cafeteria at theSmithsonian National Museum of American History in Washington D.C. Wonder what would be on the H&H menu today? Hungry for more about Horn & Hardart? 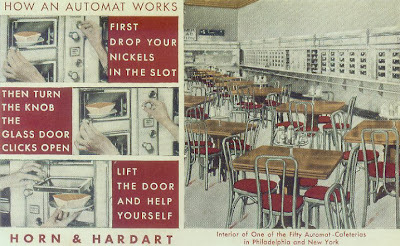 Check out "The Automat: The History, Recipes, and Allure of Horn & Hardart's Masterpiece," a book by Lorraine Diehl and Marianne Hardart, a founder's great-granddaughter. Do you remember when H&H was more popular than McDonald’s? What was your favorite H&H food? Tell us more about your favorite meal there in our comments.